Chester/Deep River Boy Scout Troop 13 newest Eagle Scout Peter Jones. Photo by Michael Rutty. 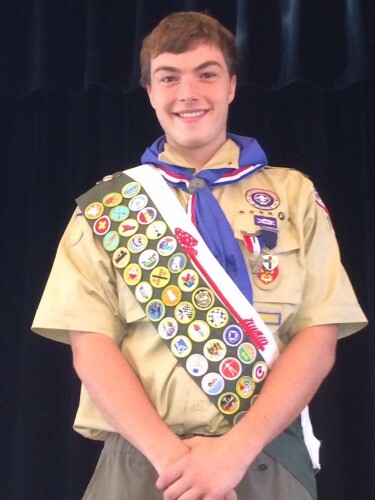 CHESTER & DEEP RIVER — Peter Jones of Deep River, a member of Chester/Deep River’s Troop 13, has earned Scouting’s highest rank and an Eagle Scout Court of Honor was held for him on Sunday Aug. 16, at the Deep River Town Hall Auditorium. To become an Eagle Scout, Peter earned 38 merit badges and advanced through the seven scout ranks by learning Scout and Life skills while simultaneously providing leadership to his Troop and service to his community. One of the final requirements for the Eagle Rank is to show leadership in and complete a service project that benefits the boy’s community, school, or religious institution. Peter’s project was to reconstruct a 20 foot long stone wall to enhance the corner of The Deep River Congregational Church’s cemetery along Platt Ln. and Essex St. The original wall had fallen into disrepair over the years from erosion. The completed wall complements the existing front wall of the cemetery and new plantings were added to the accent and beautify the area. Completing this project entailed meeting with the church to determine they stone they preferred, securing donations for supplies, designing and overseeing volunteers through the construction and installation of the wall and plantings. The completed project provides an important service to the residents of Deep River and members of Deep River Congregational Church by improving the look of the area. Troop 13 Boy Scouts serves the boys ages 11-18 of Chester and Deep River. The purpose of the Boy Scouts of America is to help young men develop their character and life skills all while having fun. There is much emphasis placed on assisting these young men to develop into strong healthy citizens who will lead our communities and country in the years ahead. The Boy Scout methods help to promote these ideals through the challenge of putting them into practice with the Troop Program. This is done in a way that is both challenging and fun. A stunning vista of the Grand Tetons by John Slonina. John Slonina, an award-winning professional nature photographer, tour leader and writer devoted to the conservation of wild places and wild things, will be the guest speaker at the Connecticut Valley Camera Club’s monthly meeting on Monday, Aug. 31, at 7 p.m. All are welcome at the meeting, which will be held in the lower level of the Deep River Library, 150 Main St., Deep River. Slonina’s goal is to use his photographs and writings to educate and inform as many people as possible about nature and environmental issues. He hopes to introduce others to places and animals that they may never have the opportunity to see. His photographs are held in private collections and galleries throughout the world. Bear cub by John Slonina. As a leader of photo tours to some of North America’s most beautiful and wild places, Slonina teaches participants how to create award winning images and shoot like a professional. He also hosts workshops and presentations. The Connecticut Valley Camera Club meets on the last Monday of every month at 7 p.m. (except December and July) in the lower level of the Deep River Library, 150 Main St., Deep River. Meetings are open to the public. For more information about the Connecticut Valley Camera Club, visit their website. AREAWIDE — Have you heard of RiverCOG? It’s an acronym for the Lower Connecticut River Valley Council of Governments, which is an association of 17 towns with each represented by its chief elected official. Its mission involves facilitating solutions and planning between the 17 towns, the State of Connecticut, federal agencies, and nonprofits for land use, transportation, agriculture, emergency management, conservation, and economic development. One of its key goals is to encourage a safe and open venue to discuss shared regional options and projects. Fulfilling this mission had led RiverCOG to launch a new and exciting project titled, GrowSMART. The purpose of GrowSMART is to research how the region can collaborate to attract workers, and retain and grow businesses while also conserving the natural resources that are so vital to the region’s infrastructure, housing values, and tourism industry. As you drive, walk, or bike around the region in September and October, you will start to notice signs, posters and banners around town such as the one shown to the left or see an advertisements while reading a local newspaper or local online news. The signs or advertisements may ask a question, such as: “Why can’t you find qualified help?” or “Who is going to buy your house”? Why is RiverCOG asking these questions? 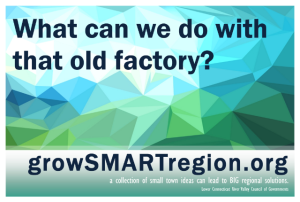 There is also an opportunity at the www.GrowSMARTregion.org website to submit your ideas directly. CHESTER — Chester is a town of many talented individuals, three of whom have donated their works to the Friends of the Chester Public Library for a fundraising raffle, culminating on Oct. 6. “The Chief’s Daughter” basket by Sosse Baker. 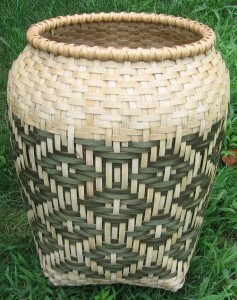 Basketmaker Sosse Baker created “The Chief’s Daughter,” a storage basket in a Cherokee pattern, 20 inches high and 16 inches wide, in dyed and natural rattan. Baker, the co-owner of Chester Gallery in Chester Center, has been a renowned basketmaker for several decades. 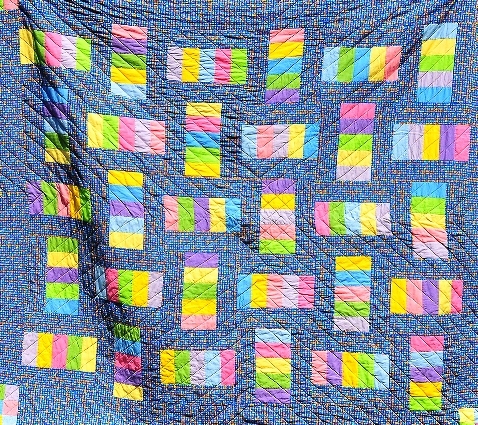 There’s also “Sorbet with Sprinkles,” a lively lap quilt made by Sally Murray. At 61 x 72 inches, it’s large enough for a couchful. It’s all-cotton construction, machine-pieced and -quilted, washer- and dryer-friendly, and bright enough to evoke a smile. Murray is a resource in Chester Library’s Human Library; check her out to learn more about quilting. 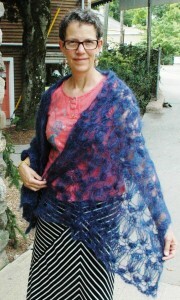 You will love to drape yourself in Lisa Tollefson’s one-of-a-kind hand-knitted lace mohair-blend stole. This original Rivergirl design, named “Midnight Passion,” is a gorgeous blue and foldable/crushable, lightweight, and surprisingly warm. Tickets are priced at $2 each and only 1,000 tickets are being sold. The three items are on display at the Chester Library. All proceeds from the raffle will directly benefit the Friends of the Library’s programs and purchases for the library. The Friends fund DVD and CD purchases and a Netflix membership; passes to area museums and attractions; professionally facilitated Spring and Fall book discussion series; materials for children’s story and craft hours; and the summer reading program. The raffle drawing will be at the Chester Library on Tuesday, Oct. 6, at 5:30 p.m. Winners need not be present to win. ‘Osprey.’ Photo by Kristopher Rowe. 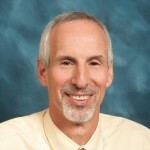 On Saturday, Aug. 29, the Connecticut River Watershed Council (CRWC) will host Dr. Paul Spitzer, a renowned Osprey researcher, for a ‘Fish Hawk Talk.’ The free event will be held at the Essex Library, 33 West Ave., Essex, from 1:30 to 2:30 p.m.
Spitzer will discuss his work in the Connecticut River Estuary and focus on the relationship between Atlantic Menhaden fish populations and Ospreys. Menhaden (commonly known as bunker) are a forage fish in the same family as herring and shad. Connecticut’s Long Island Sound (LIS) waters and the Connecticut River Estuary (CRE) are Menhaden sanctuaries. 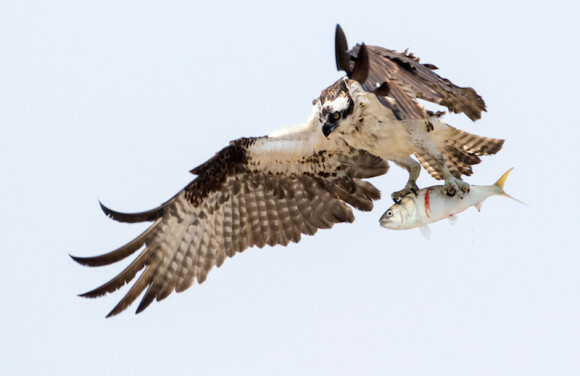 For East Coast ecology and the Osprey, Menhaden restoration is the most important paradigm shift since the banning of DDT in 1972. For more information, contact CRWC River Steward, Alicea Charamut at acharamut@ctriver.org or 860-704-0057. The CRWC works to protect the watershed from source to sea. As stewards of this heritage, they celebrate the four-state treasure and collaborate, educate, organize, restore and intervene to preserve its health for generations to come. 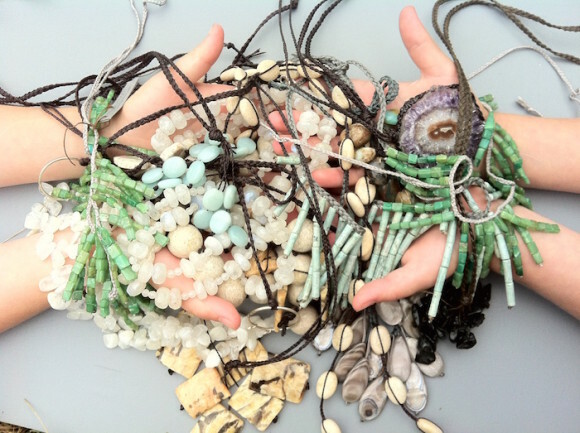 Their work informs a vision of economic and ecological abundance. To learn more about CRWC, or to join the effort and help protect our rivers, visit www.ctriver.org. 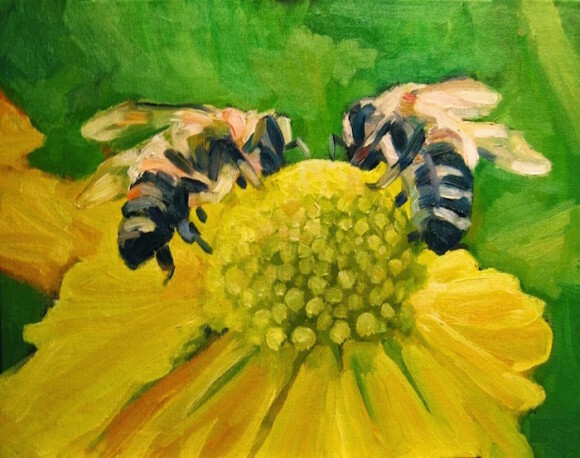 “Busy Bees” by Michael Centrella of Cheshire is just one of the numerous unframed original art pieces at Maple & Main Gallery’s Sidewalk Sale event on Aug. 29. 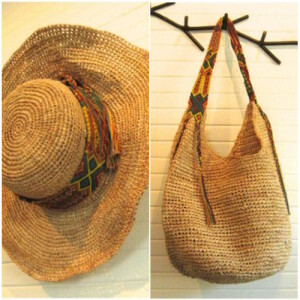 At Red Pepper, you’ll find clothing, hats, handbags, scarves, handblown glass, ceramics at 20-50% off during Chester’s Sidewalk Sale Day. The Chester Squirrel is on the run again – this time carrying a Sidewalk Sale banner for Chester’s first annual town-wide End-of-Summer Sidewalk Sale Day on Saturday, Aug. 29. Beginning at 9 a.m. on the last Saturday of August, start exploring Chester Center shops and galleries for Sidewalk Sale specials. You’ll find unique unframed art at Maple & Main Gallery, antiques at Chester Americana Antiques & Gallery, vintage pieces at Ceramica, apparel at Compass Rose, purses at Lark, and much much more in every shop in Chester. Specials may be indoors or on the sidewalk. Unique unframed art will be offered at Maple and Main Gallery during the Sidewalk Sale from 9 a.m. to 6 p.m. Out on the porch and set up inside the gallery, look for art for less because it’s not yet framed. There will be works by the gallery’s 44 artists on paper, canvas and board; from abstract to traditional; from provocative to playful. Custom-made frames add a considerable expense to a painting and can restrict buyers from choosing frames that better match their own taste and, of course, some people prefer no frames at all. While you’re at the gallery, visit the summer show of over 250 works by the gallery artists. Maple and Main Gallery, One Maple Street, is open Wednesday through Saturday from 11 a.m. to 6 p.m. and Sunday, 10 a.m. to 6 p.m. For more information, visit mapleandmaingallery.com or the gallery’s Facebook page or Instagram account or call 860-526-6065. When you get tired of shopping, find a Sidewalk Sale Special at one of Chester’s restaurants — and then head over to the Chester Fair for more small-town fun. More details at FindItInChesterCT.wordpress.com or by calling 860-322-4047. 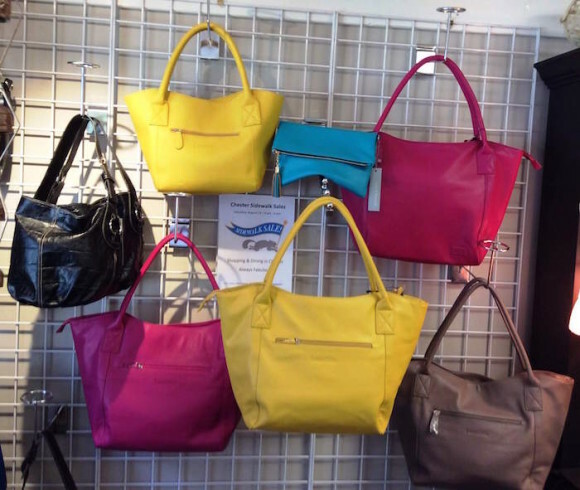 Start the fall with one of these purses found at Lark’s Sidewalk Sale. Photos of the Essex Civic Campus reproduced from the Office of Policy and Management page on the State of CT website at www.ct.gov/opm. ESSEX — The Department of Economic and Community Development (DECD) has announced that its first STEAP Grant Success Story is the Town of Essex Civic Campus Enhancement Project. Essex was awarded a Small Town Economic Assistance Program (STEAP) in the amount of $471,500 in 2013 for the Essex Civic Campus Enhancement Project which funded the expansion, repair, and improvements to the “Essex Civic Campus” located at 29 West Ave. The Civic Campus is a gateway to Essex and a center of municipal activity, including the Town Hall, Police Station, Essex Community Library, and Grove Street Park. The project included the installation and replacement of the Grove Street Park Playscape to improve compliance with Americans with Disabilities Act standards; the renovation and expansion of the Town Hall parking area; renovations to the Town tennis courts, and improved pedestrian connectivity between the Town Hall and Library. 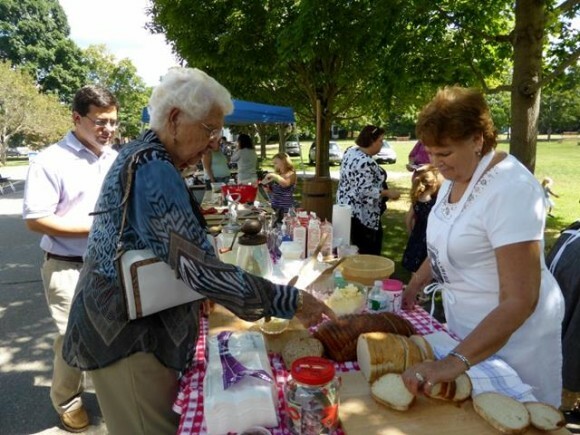 This grant provided much-needed improvements to ensure that the Essex Civic Campus is a vibrant and welcoming center of community activity, whether for recreation, public meetings, conducting business, or visiting the library. An idyllic scene of ‘The Preserve,’ where the Essex Land Trust will lead a Family Outing, Aug. 22. 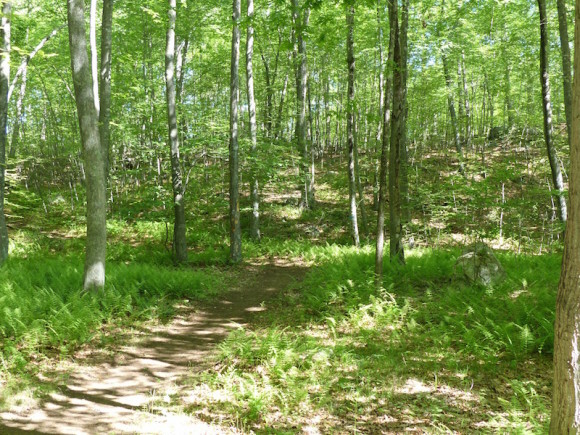 The Essex Land Trust is hosting a Family Outing in The Preserve on Saturday, Aug. 22, starting at 9 a.m. Be among the first to explore The Preserve in a hike and exploration from the Essex access to this unique forest. 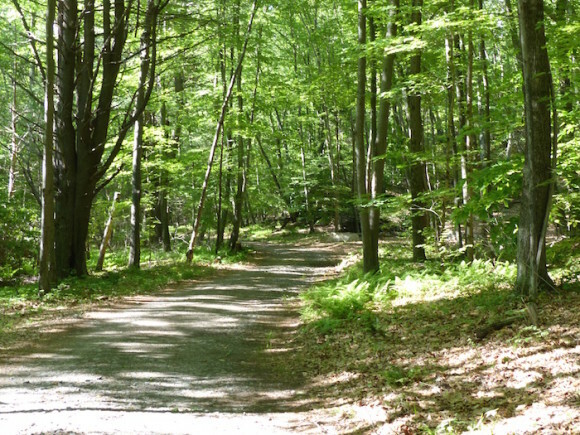 The Preserve is the recently purchased 1,000-acre forest that resides in the towns of Essex, Old Saybrook and Westbrook. This property is probably the most significant addition to Connecticut’s open space in many years. It has numerous trails, 114 acres of wetlands, including 38 vernal pools, 3,000 feet of watercourses, and a 30-acre swamp. A mature coastal forest with three rocky ridge formations, it is home to a significant and diverse population of animals and plants. Bring the family and join Chris Cryder of the Connecticut Fund for the Environment and Steven Trojan, Director of the Bushy Hill Nature Center, in exploring the critters, plants, and ponds of the new Thousand Acre Preserve. This outing will walk some easy trails and share adventures, followed by refreshments. Rain cancels. All ages are welcome. Parking and access are off Ingham Hill Rd., which is off Rte. 153, Plains Rd., Essex. CHESTER — In appreciation of their customers’ loyal support and enthusiasm, Lori Warner and Ann Lightfoot have teamed up to host the Ann Lightfoot Jewelry Summer Studio Sale on Saturday, Aug. 22, from 11 a.m. to 6 p.m. and Sunday, Aug. 23, from 10 a.m. to 4 p.m.
Find a curated mix of samples, one-offs, past seasons’ pieces, as well as many designs offered exclusively at this event, all at deeply reduced prices. A portion of all sales will help fund the art programs in local public schools through the Lori Warner Gallery Scholarship Fund. The Lori Warner Studio/Gallery is a unique source for artwork and objects that make a lasting impression. The gallery exhibits a small number of exclusive and award winning work and regularly hosts informal events featuring their represented artists and designers. The gallery is located at 21 Main Street in Chester, Connecticut. 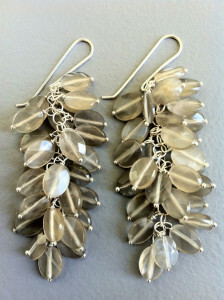 For more information, visit www.loriwarner.com or call (860) 322-4265. 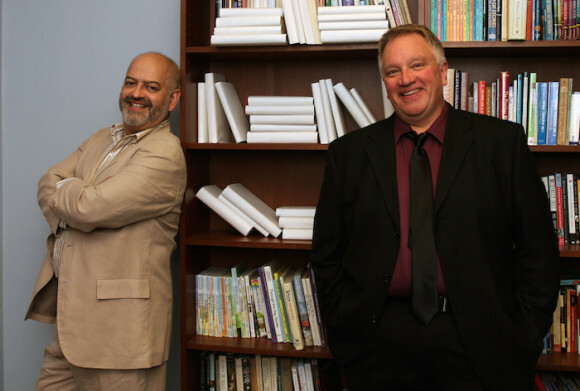 John Costa and Michael P. Cartwright star in “The Story of My Life”, presented by MiLo Productions. Photo by Robert Hughes. Award-nominees Neil Bartram and Brian Hill, will be their first stage production, running this coming Friday Aug. 21 through Sunday, Aug. 23, at Deep River Town Hall Auditorium. Do you remember the day you met your best friend? The Story of My Life tells the story of two childhood friends and how their friendship profoundly defined their lives. 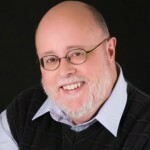 Thomas Weaver is a best-selling, award-winning author. Alvin Kelby was his best friend for 30 years. But time can test the bonds of friendship, and when it does, Thomas calls on the only resource he has — his stories of Alvin — to learn where things went wrong. Guilford resident Michael P. Cartwright will play Thomas. Cartwright is familiar to local audiences through his appearances at several area theatres. He portrayed the green-tinged title character in Warner Theatre’s Shrek. At West Hartford Community Theatre, he has appeared as Max Bialystock in The Producers and Javert in Les Misérables. He has been seen at Goodspeed Musicals in 1776, and in productions with Summer Theatre of New Canaan, River Rep, Ivoryton Playhouse, and Newington Mainstage, as well as Arden Theatre Company in Philadelphia and Delaware Theatre Company. The mental health issues addressed in The Story of My Life resonate closely for Cartwright, a clinical social worker for over 25 years, who currently works at Yale-New Haven Hospital. The role of Alvin will be played by John Costa of New Bedford, Mass. Costa comes to Connecticut directly from the Festival Theatre production of Mary Poppins, where he was featured as Admiral Boom. His regional credits include Goodspeed Musicals (1776), The Huntington Theatre (Pirates! ), American Repertory Theatre, NewRep (Ragtime), Lyric Stage Co. of Boston (1776, Big River), and The SpeakEasy Stage Co. (Carrie the musical). Other credits include Herr Schulz (Cabaret), Cogsworth (Disney’s Beauty and the Beast), Max Detweiller (The Sound of Music), and Amos Hart (Chicago) with New Bedford Festival Theatre; as well as performances with Salem Summer Theatre, Star Players, Little Theatre of Fall River, Sweet Apple, and Big Star Productions. The Story of My Life features music and lyrics by Neil Bartram and book by Brian Hill. It was produced at The Norma Terris Theatre in Chester, Conn. before making the trip to Broadway in 2009, where it was nominated for four Drama Desk Awards, including Outstanding Musical, and won a Barrymore Award for Outstanding Ensemble. Bartram and Hill were commissioned to write The Theory of Relativity by Sheridan College in Toronto as a new show specifically for college-age students. It had its London, UK premiere in May of 2014 and its regional theatre premiere at The Norma Terris Theatre in 2015. Bartram and Hill’s musical Not Wanted On The Voyage received a developmental production at Northwestern University’s Barber Theatre as part of the American Music Theatre Project. The pair are currently developing musical adaptations of Disney’s famous Bedknobs and Broomsticks and Ray Bradbury’s cult classic Something Wicked This Way Comes for the stage. Performances are Friday, Aug. 21 and Saturday, Aug. 22, at 8 p.m., and Sunday, Aug. 23, at 2 p.m. at the Deep River Town Hall Auditorium, located at 174 Main Street. Tickets are $25 for general admission seating and are available at www.milo-productions.com. The Story of My Life is produced by the Guilford-based MiLo Productions, which also produces the popular local Victorian holiday singing group Connecticut Yuletide Carolers and the Shoreline Cabaret Series. OLD SAYBROOK — The Middlesex Habitat for Humanity Special Events Committee, staff and board of directors will be hosting Happy Hour at the Old Saybrook Pavilion Aug. 22, from 6 to 9 p.m. There will be wine and beer, hors d’oeuvres donated by Cloud Nine Catering and Catering by Selene, NoRA cupcakes, music and raffles to raise money to help us dig and pour the foundation on Summer Street in Portland, CT. This event is part of the Foundation’s larger campaign, $60k in 60 days (#60kin60days) which ends Sept. 6. 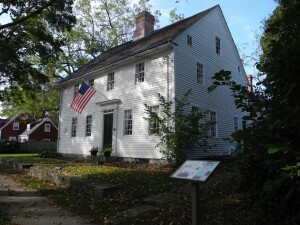 The Pratt House is home to the Essex Historical Society. 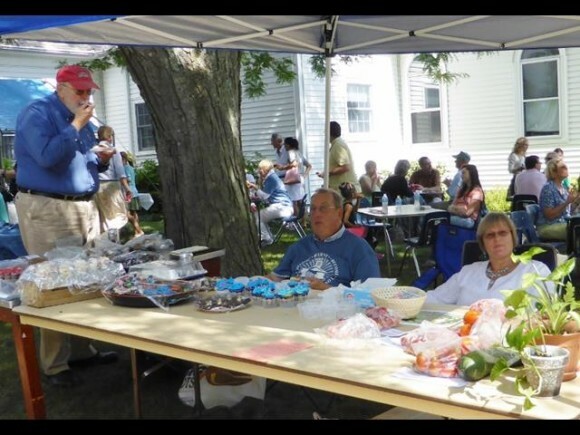 ESSEX — The Essex Historical Society (EHS), a private, non-profit organization boasting 250 members and dedicated volunteer corps, is celebrating its 60th anniversary year throughout 2015 and early 2016 with a variety of special events and programs. Of special note is the Dickinson Initiative aimed at increasing awareness of the impact of the E. E. Dickinson Witch Hazel business on Essex. The E. E. Dickinson Witch Hazel Company was an important part of Essex for much of the 20th century. The EHS and the Valley Railroad Company have partnered to refurbish the original Birch Mill /Yellow Label building that sits on the southern end of the railroad depot property. As part of the project, EHS will refurbish the Yellow Label signs and install Dickinson exhibit panels in the newly repaired space. A pre-construction kick-off took place on May 15, 2015. The dedication and unveiling of the refurbished building is targeted for one year later on May 15, 2016. Sunday, May 15, 2016. Dedication of the refurbished Yellow Label Building and tour of the Dickinson Witch Hazel Plant. Co-sponsored with the Valley Railroad Company. Details to be announced at a later date. The EHS strives to be the center of excellence for collecting and sharing historic resources for Essex and the surrounding area, and to be the facilitator among other organizations focused on the history of the area, so that we may inspire future generations. Our mission statement reflects this vision: Engaging and Inspiring the Community. Essex. Ivoryton. Centerbrook. The Essex Historical Society was formed and incorporated in 1955. According to news reports at the time, the Town of Essex was about to announce its intention to sell Hills Academy located on Prospect Street. It was no longer useful to the Town for classroom space and had been rented to various tenants for many years. A concerned group sprung into action and the first unofficial meeting of the Board of Directors was held at Essex Town Hall on Friday, Dec. 10, 1954. The newly formed Essex Historical Society purchased the Hills Academy building from the Town for one dollar. From 1955 to 1985, Hills Academy served as the Society’s meeting house, as home to its growing collection of Essex memorabilia, and as exhibit space depicting the story of Essex history. Then in 1985, the Society for the Preservation of New England Antiquities (known then as S.P.N.E.A. and now renamed Historic New England) deeded the Pratt House Museum on West Avenue to the Society and the focus of activity shifted to the Pratt family narrative. Today, Pratt House continues to interpret 18th century farm life in Essex and the nine generations of Pratt Smithies, many of whom lived in the house. The barn houses a set of panels depicting a time line of Essex history and an early loom that is worked on by an award-winning group of weavers. The beautiful meadow to the rear of the property is the site of the Community Garden and often the scene of antique car shows and old fashioned summer fairs. Hills Academy provides additional meeting and exhibit space on the first floor and storage and office space on the second floor for the collection and archival files. The EHS serves the three villages of Essex — Centerbrook, Essex and Ivoryton. 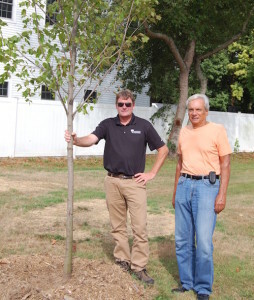 ESSEX — Dan Estey (left) donated a Red Sunset Maple (Acer rubrum ‘Franksred’) on behalf of Bartlett Tree Experts to the Town of Essex. He is pictured with Augie Pampel, Essex Tree Warden, who selected the location at 147 Dennison Rd. AREAWIDE — Madhatters Theatre Company is currently scheduling audition appointments for their December musical comedy production of ‘Best Christmas Pageant Ever’ at Chester Meeting House. Auditions will be held on Saturday, Aug. 29, from 10 a.m. to 2 p.m. at Lymes’ Youth Service Bureau, 59 Lyme St. in Old Lyme by appointment only. To schedule an appointment, call (860) 395-1861 or e-mail madhattersctc@aol.com. ‘Sheep in the Meadow’ by Amy Knaggs of Chester is one of the signature paintings in the Summer Exhibit. CHESTER – All new art from cutting edge to traditional is featured in the sixth annual Summer Exhibit at Maple and Main Gallery where a gala opening reception will be hosted by the gallery Saturday, July 25, from 5 to 8 p.m. 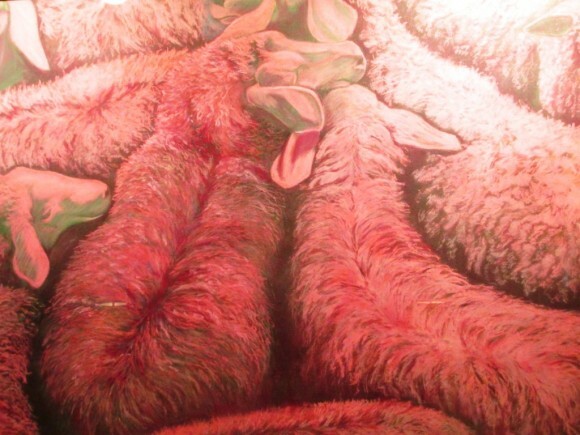 The exhibition includes paintings and sculptures by 40 Connecticut artists, some showing at Maple and Main for the first time. ‘Down the River’ by Claudia Van Nes of Chester. Popular musician Alan James will play during the reception and from 6 to 7 p.m, there will be wine tasting by the Chester Package Store. The gallery will also be serving wine and a selection of hors d’ouevres, including pizza, during the evening. Concurrently, the “Hats, Hats, Hats” show of paintings depicting hats in all manners and styles is on view in the Stone Gallery in the lower level of the gallery. The show opens Wednesday, July 22, and runs through Sept. 20. Maple and Main, at One Maple Street, is open Wednesday through Saturday from 11 a.m. to 6 p.m, and Sunday from 10 a.m. to 6 p.m.
Mapleandmaingallery.com; mapleandmain@att.net; 860-526-6065. The gallery is also on Facebook and Instagram. AREAWIDE — State Representative Philip Miller (D-36th) will participate in an event on Thursday, Aug. 13, celebrating the permanent protection of “The Preserve,” the 1,000 acre coastal woodland. 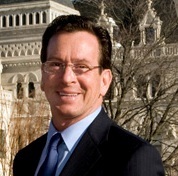 Miller will be joining Connecticut Governor Dannel P. Malloy and other state and local officials at the reception and ribbon-cutting ceremony on Thursday from 4 to 7 p.m. at Great Cedars (West) Conservation Area, 155 Ingham Hill Rd., Old Saybrook. Miller is inviting attendees to join him in a hike he will be leading at “The Preserve” following the opening ceremony. CHESTER — For its 42nd season, the Robbie Collomore Music Series will offer all four of its concerts in the fall, between Sept. 27 and Nov. 29. As always, the Collomore Committee, chaired by Martin Nadel, has chosen a mix of music genres for the season. All four concerts will be on Sundays at 5 p.m. in the Chester Meeting House. Beginning the season, on Sept. 27, is the Barbara and Edmund Delaney Young Artists Concert. Cellist Julia Bruskin debuted with the Boston Symphony at age 17 and now performs as a member of the Metropolitan Opera Orchestra and internationally as a soloist. She will perform in Chester with her husband, Aaron Wunsch, an internationally known pianist and a member of the Juilliard piano faculty. The Hot Club of Detroit, a jazz ensemble specializing in the Gypsy jazz sound made famous by guitarist Django Reinhardt, performs on Nov. 8, followed on Nov. 29 by classical guitarist Jorge Caballero. He is the youngest musician and the only guitarist to win the Naumburg International Competition, one of the most prestigious and coveted awards given to performers of any instrument. Buy a season subscription and save money, plus you’ll be certain you will have a seat even when the concert is sold out. A subscription to all four concerts is just $72 (that’s four concerts for the price of three). Individual concert tickets cost $24. For students from elementary through graduate school, a subscription is $15. A student ticket for just one concert is $5. Tickets can be purchased online at www.collomoreconcerts.org using PayPal. All ticket-holders are invited to stay for a reception after the concert to meet the performers. For more information, check the website or call 860-526-5162. Photo: Check your calendars and order your season subscription for this year’s Collomore Concerts! All the info is on the website. Have you ever wondered what is happening under the surface of the Connecticut River? What fish are there and when? And what is being done to protect the fish and their habitat? RiverQuest receives questions like these about the fish that inhabit our part of the Connecticut River on every cruise it runs. RiverQuest is hosting a Sunset Cruise on Wednesday, Aug. 12, from 6 to 8 p.m. with Fisheries Biologist Steve Gephard, which presents an opportunity to have all these questions answered. Gephard is a supervising fisheries biologist with the State of Connecticut, Department of Energy and Environmental Protection’s Inland Fisheries Division. He is in charge of the Division’s Diadromous (fish that migrate between fresh water and salt water) Fish Program and its Habitat Conservation Program. He has over 35 years of experience with diadromous fish species and fish passage projects. This will be a relaxing, informational cruise departing from Eagle Landing State Park in Haddam, on which guests are invited to bring a picnic, favorite beverage and any “fishy” questions they have. RiverQuest will depart from Eagle Landing State Park in Haddam at 6 p.m. The cost per person is $30. To learn more about this informative cruise and reserve a spot via on-line booking, visit ctriverquest.com or call 860-662-0577. 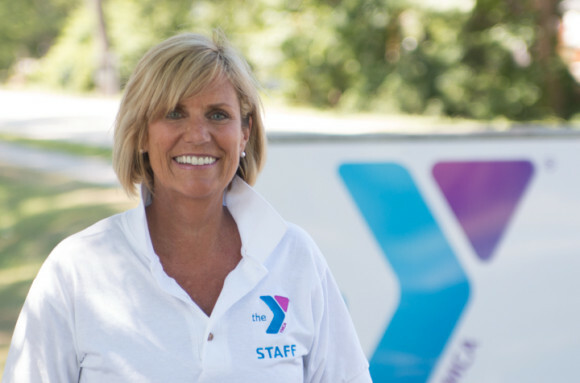 Donna Scott, former owner of IFoundFitness in Deep River, is joining the Y’s staff. 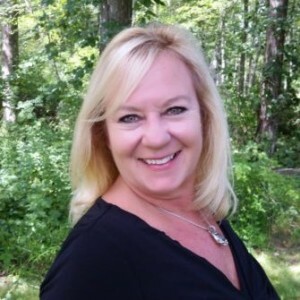 AREAWIDE — The Valley Shore YMCA has announced that Donna Scott, owner of the Best of the Shoreline’s Readers Poll IFoundFitness located in Deep River, will join the staff team of the Valley Shore YMCA at the end of August as a Wellness Coordinator. Earlier in the summer, Scott had decided to close her popular fitness studio and started thinking about the next chapter of her life. In her new role at the Y, Scott will be in charge of personal training, the Y’s Wellness Center, active older adult initiatives as well as running the ever popular Slim Down challenges throughout the year. Editor’s Note: For further information about the Valley Shore YMCA, visit their website or call 860.399.9622. AREAWIDE — Handcrafted ceramic pottery, children’s toys, specialty jewelry and even blown glass that glows in the dark— these are among the many items one will find at Creations, a unique gift shop, which opened Thursday in the heart of downtown Madison. Located at 712 Boston Post Rd., Creations showcases the beautiful work of more than 60 artisans from throughout the Northeast. These artists— from the mom who found inspiration in her child or the grandchildren who resurrected their grandparent’s legacy— each have stories that deserve to be shared with the world. They imagined the possibilities and followed their dream of creating gifts that can be used, loved and talked about for many years to come. Shoppers will find products for men, women, children and the home. The store will also feature a variety of seasonal items. All proceeds from the store benefit Vista. Creations is a social enterprise of Vista Vocational & Life Skills Center of Westbrook. Based in Madison and Westbrook, Conn., Vista is a 501©3 nonprofit organization. Vista’s mission is to provide services and resources to assist individuals with disabilities achieve personal success. For more information about the store including its opening hours, visit the store’s website. 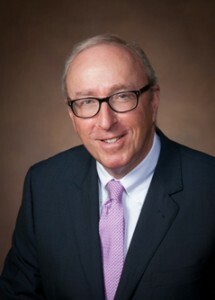 ESSEX — Gregory R. Shook, President & CEO of Essex Savings Bank announced the completion of distribution from the Directors’ portion of the Community Investment Fund. Total distributions for the year will amount to $100,000 and will surpass $4 million since the program’s 1996 inception of distributing 10% of after tax net income. Donations for this portion have been allocated to the following non-profit organizations. Angel Charities, Inc. * Camp Hazen YMCA * The Chester Historical Society, Inc. * Child & Family Agency of Southeastern Connecticut, Inc. * Community Foundation of Middlesex County * Connecticut River Museum at Steamboat Dock * The Deep River Historical Society * Essex Historical Society * Florence Griswold Museum * The Ivoryton Library Association * Ivoryton Village Alliance * Katharine Hepburn Cultural Arts Center & Theatre * Lawrence & Memorial Hospital * Lyme Academy College of Fine Arts * Lyme Art Association * Lymes’ Youth Service Bureau * MacCurdy Salisbury Educational Foundation, Inc. * Madison Land Conservation Trust * Middlesex Hospital * Middlesex United Way * The Old Lyme-Phoebe Griffin Noyes Library Association, Inc. * Rotary Club of Essex Foundation * Tri-Town Youth Service Bureau, Inc. * Valley Shore YMCA * Vista (Vocational Independent Supported Transitional Alternative). 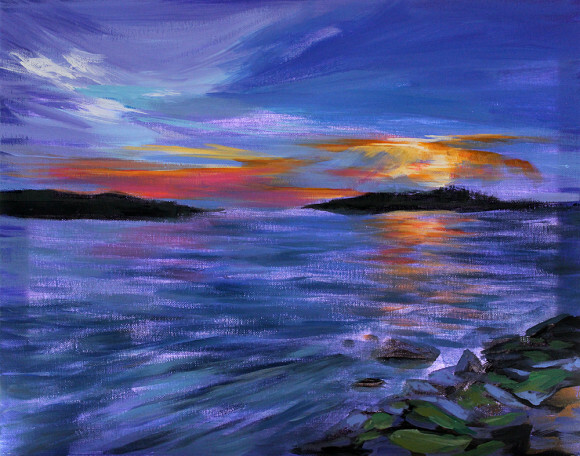 Participants in the upcoming “Paint Night” will paint the view of Tuxis Island from the Madison Surf Club. AREAWIDE — The Vista Arts Center is hosting a special “Paint Night with Vista” at the Madison Surf Club on Monday, Aug. 17, from 6 to 8 p.m. Participants will paint the view of Tuxis Island from the patio of the Surf Club alongside local celebrities Madison First Selectman Fillmore McPherson, architect Duo Dickinson and WTNH newscaster Jim Watkins. At the end of the evening, participants take their works of art home. A social art class offered by the Vista Arts Center, “Paint Night” is open to community members of all artistic skill levels. No prior painting experience is required. 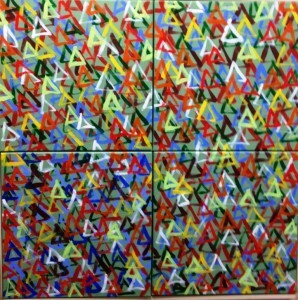 The class will be led by local artist and Vista staff member Samantha Listorti, who will provide step-by-step guidance. The cost for this special evening is $40 per person. Food will be available for purchase at the Surf Club. Because space is limited, registration is required. To secure your seat, visit the Vista website or contact Amanda Roberts, Arts Program Manager, at 860-399-8080 or aroberts@vistavocational.org. The mission of the Vista Arts Center is to provide quality arts programming to a diverse, adult population that promotes self-expression and learning in a nurturing, noncompetitive environment. Based in Madison and Westbrook, Conn., Vista Vocational & Life Skills Center is a 501(c)3 nonprofit organization. Vista’s mission is to provide services and resources to assist individuals with disabilities achieve personal success. 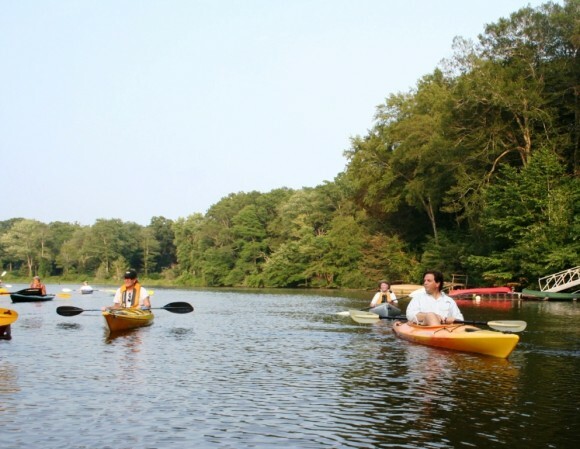 Essex Land Trust offers a kayak trip into North Cove, Aug. 6. ESSEX — The Essex Land Trust invites you to bring your own boat on Saturday, Aug. 6, for this popular summer kayak/canoe trip into peaceful North Cove and Falls River, accompanied by a naturalist. See the abundant wildlife and revisit the history of this waterway where many of Essex’s colonial ships were built. Participants should arrive at 4:30 p.m. to register on-site at Bushnell Street public boat launching site off of North Main St., Essex, and launch their crafts on the rising tide prior to the 5 p.m. departure time. A safety boat will accompany. Bad weather cancels. Note: this event was originally scheduled for June 6 but was postponed due to poor weather conditions. North Cove is a 230-acre body of tidal water between the Falls River and the Connecticut River. The Cove was noted for shipbuilding, and the nearby Williams’ yard turned out sloops and schooners for the commercial trade in the 19th century. The cove is formed in part by Great Meadow, a 174-acre “pendant bar” or levee along the Connecticut River. Great Meadow has no public access. Empty now, Great Meadow was once a beehive of activity. Cattle were grazed, salt hay was harvested and duck hunting blinds once lined the shore. The bar was also a base for the local fishing industry and its lucrative seasonal shad run. CMS Kindermusik teacher Nancy Thomas (front row, kneeling, second from right) is joined by members of the Community Foundation of Middlesex County grants committee and participants in a Pop-Up Day. Photo courtesy of Community Music School. 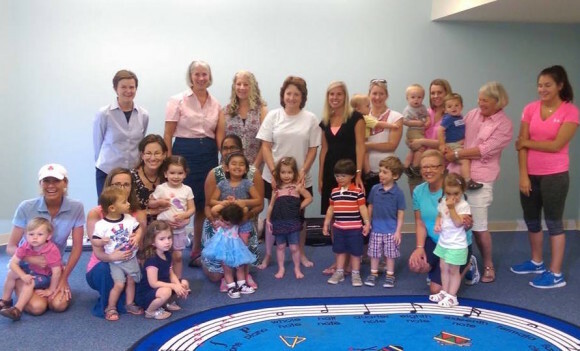 CENTERBROOK – Community Music School (CMS) has announced receipt of a $2,000 grant from the Community Foundation of Middlesex County to support the award-winning early childhood program, Kindermusik. Community Music School used the funds to present Kindermusik Pop-Up Days throughout the community during the summer and will offer Kindermusik scholarships for its fall semester. The final Pop-Up Day takes place on Wednesday, Aug. 26, at 10 a.m. at CMS, 90 Main St., Centerbrook. The classes are recommended for ages 18 months to 4 years and offer a fun-filled 45 minutes of singing, dancing, and lots of giggles! Additionally, interested families can attend a preview Kindermusik class during the School’s Open House on Tuesday, Sept. 15. Three distinct age-appropriate classes are offered that day: Village Class for 6 to 18-months-old will be at 9 a.m.; Time class for 18 months to 3-years-old will be at 10 a.m.; and Imagine That for 3- and 4-year-olds will take place at 11 a.m.
For more information about Kindermusik, the scholarship program, other Community Music School programs, visit www.community-music-school.org or call 860-767-0026. The Community Foundation of Middlesex County is a nonprofit organization whose mission is to improve the quality of life for the people of the County, now and in the future, by developing endowments, making grants that have impact and assisting donors in meeting their philanthropic objectives. Since its founding in 1997, the Community Foundation has awarded 907 grants totaling over $2.8 million for the arts, cultural and heritage programs, educational activities, environmental improvements and for health and human services. Community Music School is a not-for-profit arts organization that has been serving the music education needs of students for nearly 30 years. Founded in 1983, Community Music School has grown steadily over the years and now occupies 6,000 square feet of space in two buildings with 17 studios and small group performance space. Today, CMS has nearly 500 students of all ages from Essex and 17 surrounding towns throughout Middlesex, New London and New Haven counties. The mission of CMS is to provide a full range of the finest possible instruction and musical opportunities to persons of all ages and abilities, to increase appreciation of music and to encourage a sense of joy in learning and performing, thus enriching the life of the community. Self portrait by C.D. Batchelor. DEEP RIVER — Viewed by millions daily in The New York Daily News and syndicated in 1,000 newspapers across the country, the work of C.D. Batchelor was thought-provoking and challenged the reader to draw his own conclusions. 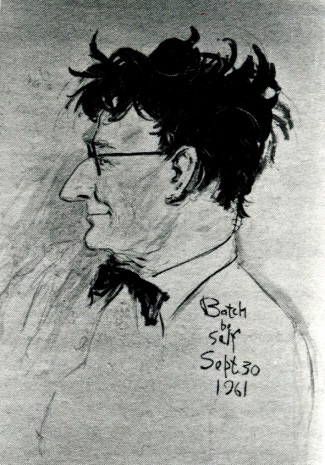 Batchelor was hired by The New York Daily News in 1931 and his strong, graphic cartoons filled the upper-right columns of the editorial page, seven days a week for the next 25 years. He was the first political cartoonist to win the Pulitzer Prize in 1937 and by 1947 his work was circulated to nearly three million readers. Funded in part by a grant from the Connecticut Humanities, the Deep River Historical Society invites you to step into his world, view a collection of his work that spanned 40 of the most turbulent years in U.S. history. The exhibit titled, “Draw Your Own Conclusions: The Political Cartoons of C.D. Batchelor,” will be open at the Stone House of the Deep River Historical Society at 245 Main Street, Deep River on Saturdays and Sundays from 2 to 4 p.m. through the months of July and August. Also in the Stone House are Victorian furniture, historic paintings, and collections of Deep River businesses and products including Niland cut glass, and ivory products of Pratt, Read & Co. Visitors may also see the last remaining restored bleach house for piano keys. One of C.D. 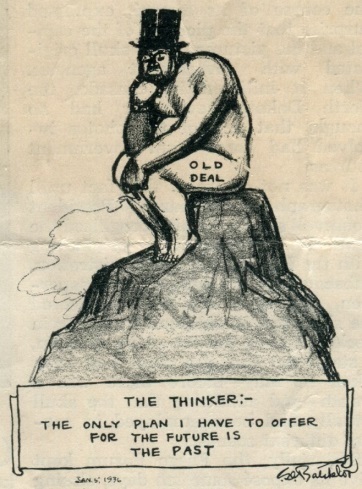 Batchelor’s famous cartoons. Editor’s Note: Connecticut Humanities, a nonprofit affiliate of the National Endowment for the Humanities, supports cultural and historic organizations that tell the state’s stories, build community and enrich lives. Taavon Gamble*, Michael Sullivan, Teren Carter*, Mya Rose and Kevin Moeti in a recent rehearsal. IVORYTON – After the first two previews and two instantaneous standing ovations, the phones are ringing off the hook at the Ivoryton Playhouse. Memphis exploded onto the Ivoryton stage yesterday evening and audiences were captivated from the first “fantastical” number. The Ivoryton Playhouse has now left the sunny tropical shores of the South Pacific and traveled to the sizzling backstreets of ‘50s Memphis. 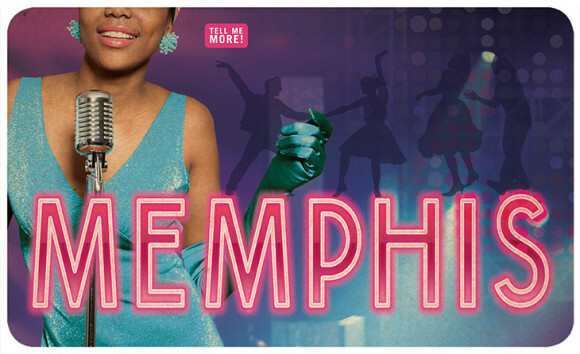 The show is set in the places where rock and roll was born – the seedy, underground dance clubs, radio stations and recording studios in 1950s Memphis, Tenn. Inspired by true events, this high energy musical tells the story of DJ Huey Calhoun, who falls in love with a beautiful singer and battles cultural divides as he tries to bring her voice to the airwaves of America. Renee Jackson* and Chawnta Marie Van in rehearsal. As their careers rise, a revolution erupts when his vision meets her voice and the music changed forever. With an original score, this musical is filled with heart, soul and energy to burn! Winner of four 2010 Tony Awards, Memphis was written by Joe DiPietro (I Love You, You’re Perfect, Now Change, All Shook Up) with electrifying blues, rock, ballads and gospel music created by Bon Jovi’s David Bryan. Writer Joe DiPietro will be joining the cast on stage for talk back after the performance on opening night, Friday, Aug. 7, followed by a reception with the cast and crew. Limited tickets are still available for this performance. Renee Jackson* and Carson Higgins* study their parts for Memphis. 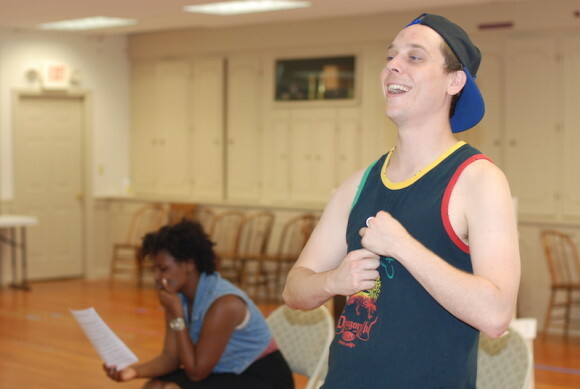 The Playhouse production of Memphis is directed and choreographed by Todd Underwood, whose last work was seen at the Ivoryton Playhouse as choreographer for La Cage aux Folles and Dreamgirls. The show features Carson Higgins* as Huey, Rénee Jackson* as Felicia Farrell, Teren Carter* as Delray, Jamal Shuriah* as Gator. This musical is directed by Michael Morris, the set is designed by Martin Scott Marchitto, lighting by Doug Harry and costumes by Elizabeth Cipollina. 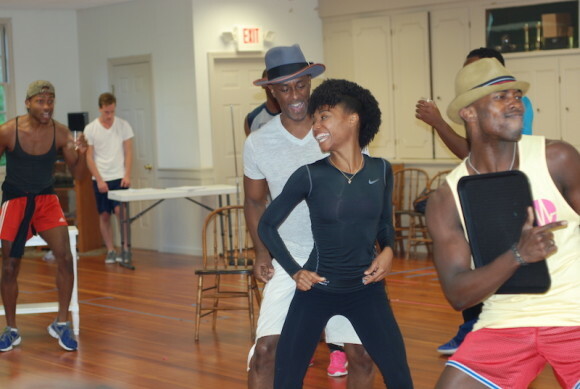 Memphis opens at the Ivoryton Playhouse in previews on Wednesday, Aug. 5, (official opening Friday, Aug. 7) and runs through Aug. 30. Performance times are Wednesday and Sunday matinees at 2 p.m. Evening performances are Wednesday and Thursday at 7:30 p.m., Friday and Saturday at 8 p.m. 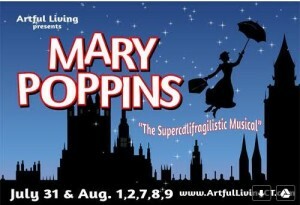 There will be two additional Saturday matinees on Aug. 22 and 29 at 2 p.m. This production of ‘Memphis’ is generously sponsored by: Pasta Vita, First Niagara, Sennheiser and Saybrook Country Barn. What do Connecticut’s own PT Barnum and I have in common? No, not just a love of circuses. We are both “rail advocates” fighting for the interests of commuters. This amazing piece of news about Barnum, a man better known for his showmanship and menageries, came to me while watching a speech at the Old State House in Hartford broadcast on CT-N (every policy wonk’s favorite channel). The speaker was Executive Director and Curator of the Barnum Museum Kathleen Maher. In 1879 Barnum wrote an impassioned letter to the NY Times promoting a street railway be built in New York City along Broadway between Bleecker and 14th Street, enlisting the support of local merchants such as the Brooks Brothers and, “the carpet men, W & J Sloan”. Earlier, in 1865, Barnum went to Hartford representing the town of Fairfield as a Republican — later he became Mayor of Bridgeport. As he writes in his autobiography, he arrived at the capitol to find that powerful railroad interests had conspired to elect a Speaker of the House who had protected their monopoly interests in the state. Further, he found that Connecticut’s “Railroad Commission” had been similarly ensnared by the industry it was supposed to regulate and that one member was even a clerk in the office of the NY & New Haven RR! Barnum pushed through a bill prohibiting such obvious conflicts of interest. Then he turned his sights on helping commuters. Barnum noted that New York railroad magnate Commodore Vanderbilt’s new rail lines (now the Hudson and Harlem divisions of Metro-North) were popular with affluent commuters. Once Vanderbilt had them hooked as passengers for their daily ride into and out of New York City, he jacked up fares by 200 to 400 percent. Sensing that Vanderbilt might try to do the same to Connecticut riders on the new New Haven line (in which “The Commodore” had a financial stake), Barnum set to work in the legislature to make sure the state had some control over “its” railroad. 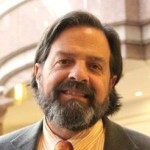 Barnum said his only ally in the fight was then-State Senator Ballard of Darien. Fast forward to the present and we could again use Barnum’s help. Though Connecticut hires Metro-North to run “our” trains on “our” tracks, our contract with that New York state agency gives us little say and no seat on it board. As one lawmaker noted, the Connecticut Department of Transport defends Metro-North much as a kidnap victim fights for its captor (what he called the Stockholm syndrome). OLD SAYBROOK — Cappella Cantorum and Con Brio will sponsor a Summer Sing Monday, Monday, Aug. 10, 7 p.m. at St. Paul Lutheran Church, 56 Great Hammock Road, Old Saybrook featuring Haydn’s ‘Lord Nelson Mass.’ This session will be conducted by Steve Bruce, Con Brio Chorual Society. Professional Soloists will perform the solos and all singers are welcome. An $8 fee covers the cost of the event. Scores will be available, and the church is air-conditioned. Larry Kaplan will give a concert “On the Dock,” Thursday, Aug. 6. 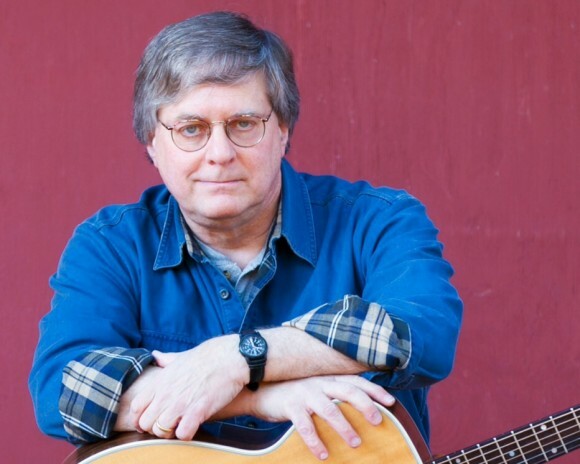 ESSEX — On Thursday, Aug. 6, from 5:30 to 7:30 p.m., the Connecticut River Museum will host acclaimed folk musician and composer Larry Kaplan at its ‘Thursdays on the Docks’ concert series. Considered by many as one of the best song-makers in the folk song revival, Larry Kaplan’s music is known widely in both the US and internationally for its strong storytelling and for its simple and beautiful melody lines. His songs have been sung and recorded by many contemporary and traditional folk artists around the world. Accompanying himself on guitar and banjo, many of his works have deep roots in his native New England, and respectfully capture the spirit that derives from small, often quiet events in history that have shaped the New England spirit, some serious, some funny, many eccentric, all real. “Old Zeb,” “Song for Gale,” “Song for the Bowdoin,” “John,” “Get Her into Shore,” “Selling the Isabel,” “Aroostook” are just a few examples of his work — poignant stories in song, written in the truest folk tradition, honest, highly singable … always memorable. Kaplan has just released a new CD through Folk Legacy Records, “Songs for an August Moon,” and will be introducing a new offering of music from that recording and an upcoming release along with many familiar favorites. Visitors can enjoy the live music while taking in the views of the Connecticut River. New this year, the Essex Wellness Center is offering free back massages during the concert. Picnic dinners provided by Porky Pete’s BBQ (hamburgers, grilled chicken, hot dogs, and BBQ sandwiches) will be available for purchase on the night of the event. The Museum also runs a bar with non-alcoholic drinks, beer and wine. ‘Thursdays on the Dock’ is made possible by the Essex Wellness Center and Connecticut River Dock & Dredge and takes place on the grounds of the Connecticut River Museum every Thursday night through Aug. 27 from 5:30 to 7:30 p.m. This concert is a benefit concert to help the Museum continue and grow its community offerings. The concert is free, donations gratefully accepted. For more information on this and other museum programs, visit www.ctrivermuseum.org. The Connecticut River Museum is located at 67 Main Street, Essex and is open daily from 10 a.m. to 5 p.m. For more information, call 860-767-8269 or visit www.ctrivermuseum.org. AREAWIDE — To help motivate and inspire kids to discover their potential, the Valley Shore YMCA is offering afterschool programs to school-aged children throughout Westbrook, Chester, Clinton, Deep River, Essex and Old Saybrook schools. The Y’s afterschool program combines academics with play and offers a caring and safe environment where youth can achieve, feel a sense of belonging, build relationships and explore new interests. One in four U.S. children is left unsupervised at the end of school day, according to the Afterschool Alliance, a nonprofit public awareness advocacy organization. With the start of the new school year, the Valley Shore YMCA encourages parents/caregivers to make sure that children are involved in safe, educational experiences after school hours. “Research shows that afterschool programs can help children perform better in school, practice healthy habits and engage in positive lifestyle behaviors. If left unsupervised at the end of the school day, students miss out on positive influences that encourage achievement and deter risk-taking activities,” said Kathy Scholl, School Age Program Director, Valley Shore YMCA. The Y is a leading nonprofit committed to nurturing the potential of every child and through afterschool programming, supporting their social-emotional, cognitive, and physical development from birth to career. In the Valley Shore YMCA’s afterschool program youth receive homework help and attention to healthy eating during snack time and can also explore arts and crafts and physical activity all under the guidance of our enthusiastic Y staff. Financial assistance is available to those in need, to ensure every child has the opportunity to learn and grow at the Y. For more information about the Valley Shore YMCA’s afterschool program, contact Kathy School, School Age Program Director, at 860.399.9622 ext 118, vsymca@vsymca.org or visit vsymca.org. AREAWIDE — Literacy Volunteers Valley Shore (LVVS), CT, Inc. is a private non-profit organization. Its mission is to train tutors to teach Basic Reading (BR) and English as a Second Language (ESL) to residents of the Valley Shore area, who wish to improve their reading, writing or speaking English to improve their life and work skills. This one-to-one instruction is held confidential and is completely without charge to the student. Tutor training is a 14-hour program conducted over seven sessions held each fall and again in the spring each year. 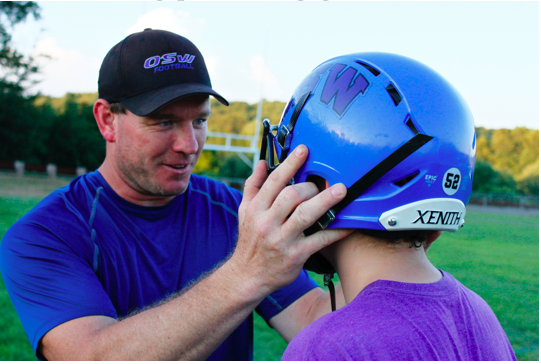 The next training session begins Sept. 17, and runs through Nov. 12. Registration for the fall session is open now and the deadline for applications is Aug. 28. Workshop Leaders have developed a comprehensive program that provides prospective tutors the skills and resources to help them succeed. A background in education is not necessary – just a desire to tutor and a commitment to helping a student improve their skill in basic literacy or English as a Second Language over the period of one year after the completion of training. If you are interested in becoming a tutor, contact the Literacy Volunteers office in the lower level of Westbrook’s Public Library by phone at 860-399-0280 or e-mail at jferrara@vsliteracy.org. A gift of Elizabeth Barnes Callender in 1998, Osage Trails is a waterfront park with a sweeping lawn, a waterside meadow and a patch of forest where the Falls River forms Falls River Cove. 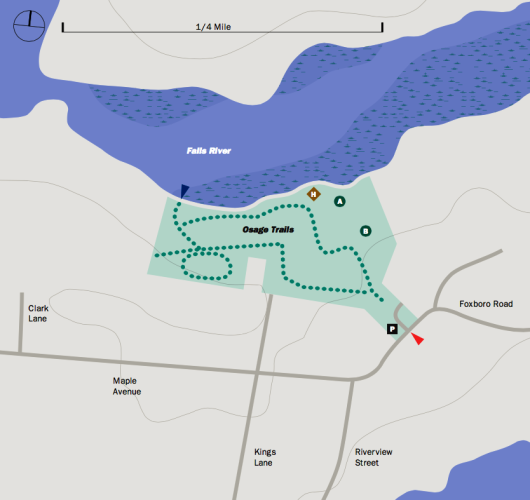 The easy, well-marked loop trail winds through woods and wetlands close to the water as well as along higher ground inland. A Battle Site Essex sign panel on the shore of the Falls River commemorates the British raid that took place on April 4, 1814. Across the Falls River one can still see the stone bulkhead extending into the cove and a fieldstone building foundation, which are the only remains of the Williams’ shipbuilding yard targeted by the British in their attack on Essex. To reach Osage Trails, take Maple Avenue, off North Main St. to Foxboro Rd. entrance, Essex. Refreshments will be provided. 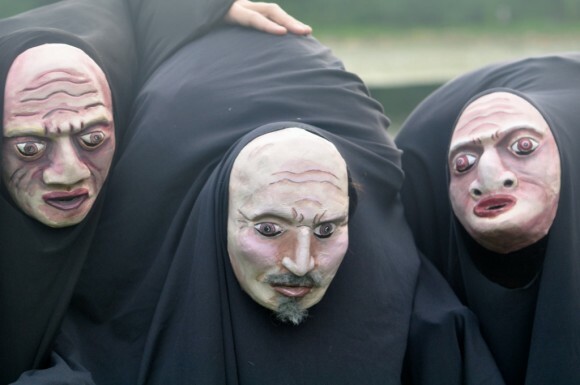 Flock Theatre presents Shakespeare’s ‘Titus Andronicus’ as part of the Connecticut River Museum’s Theater Along the River, Aug. 1. Photo courtesy of Flock Theatre. 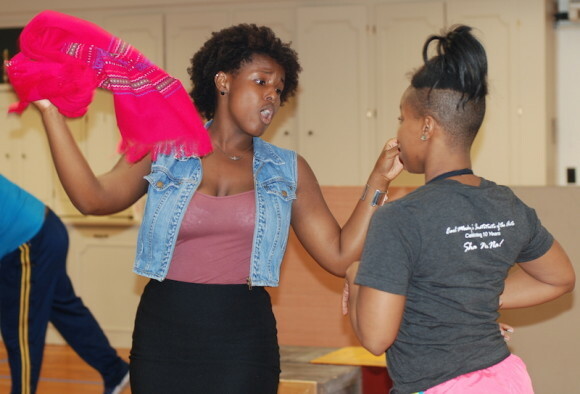 ESSEX — On Saturday, Aug. 1 the Connecticut River Museum’s Theater Along the River returns with the Flock Theatre production of William Shakespeare’s Titus Andronicus. Bring a picnic dinner, and enjoy a summer evening with the Bard. Made possible by presenting sponsor Essex Wellness Center with additional support from Wells Fargo Advisors, Titus Andronicus is thought to be Shakespeare’s first tragedy. Written between 1588 and 1593, it was highly popular in its day but fell out of favor in the Victorian era due to its graphic violence. The story follows a fictional Roman Empire general named Titus through a cycle of revenge with Tamora, Queen of the Goths and is often viewed as Shakespeare’s attempt to emulate the revenge plays of his contemporaries. Tickets are $15 for the general public and $10 for children (12 and under). No carry-in alcohol is permitted. Tickets may be bought at www.ctrivermuseum.org or at the door starting at 6 PM the night of the performance. Curtain opens at 7 PM with a rain date of Sunday, August 2. The Pratt House in Essex is the town’s only historic house museum. ESSEX — Combine a love of history and (light) exercise as Essex Historical Society (EHS) launches a new program, “Walking Weekend,” on Friday, July 31, and Saturday, Aug. 1. The event features two different walking tours of Essex Village in which attendees enjoy an easy stroll down the seaport’s 18th century streets learning about the major industries, structures and personalities that shaped the area. Essex Historical Society’s trained, knowledgeable volunteer guides will lead an hour-plus long tour over fairly level, paved terrain, covering three centuries of history. 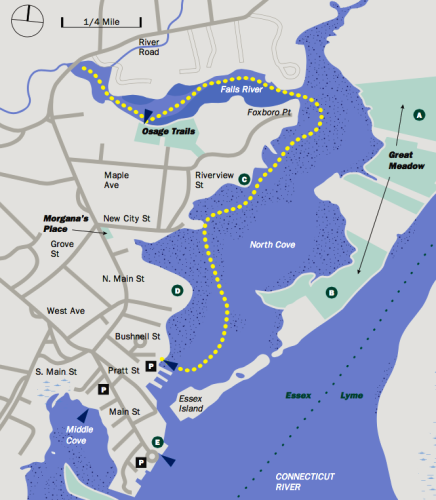 On July 31, at 7 p.m., the first tour will meet at the Foot of Main Street, Essex, for a trip down Main Street to capture the rich maritime history of 18th century “Potapaug,” its working waterfront and ship-building prominence in the early 19th century, as well as its development as a beautiful visitor destination of today. On Aug. 1, at 1 p.m., the second tour will meet at the Pratt House, 19 West Ave., for a trip down West Ave. and Prospect Street to explore the histories behind the structures of “Pound Hill” including several 19th century churches, Hills Academy, the Old Firehouse and more. Each tour is $5 per person and open to the general public. 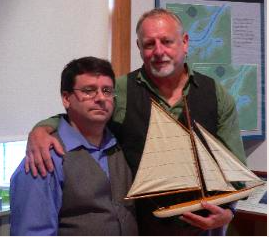 Admission helps support the educational and cultural programming of Essex Historical Society. Join a tour for fun, facts and fresh air. Attendees are also welcome to tour the historic 1732 Pratt House, the town’s only historic house museum. Formed in 1955, EHS is committed to fulfilling its mission of engaging and inspiring the community in the three villages of Centerbrook, Essex and Ivoryton.